All seats are the same right? Especially when it comes to putting on a corporate event. But there are no hard and fast rules about event seating, so long as your clients or guests are comfortable surely anything goes? If you are still not convinced we have put together some fun seating ideas that can easily be adopted to many different types of events. 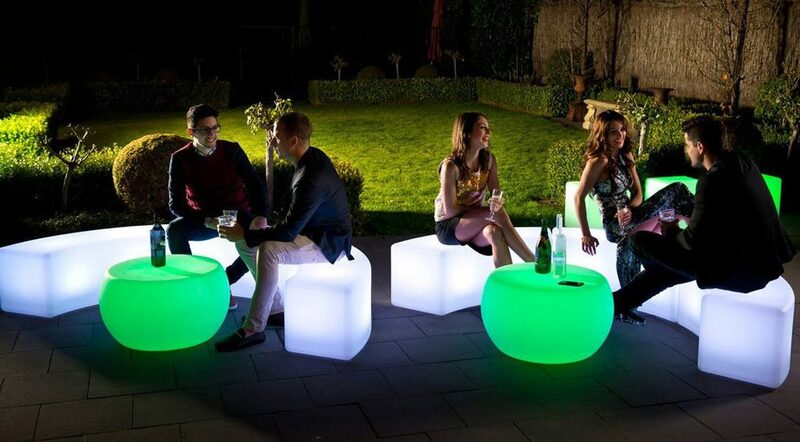 Still fairly new to the furniture hire scene, LED furniture comes in all different shapes and sizes and you can go all the way and make a huge statement by hiring all LED furniture or by dotting around unique items. LED furniture doesn’t just work in club or contemporary events, it is amazingly versatile and looks fantastic at weddings, parties or even company events. Bar stools are not just for bars, they work really well in small spaces where you need to create more seating as they don’t take up much space themselves. They also work well in conferences where you have a smaller stage area as you can pop them at the back to raise your guests up for a better view. Pop them on the stage for your speakers to create a more impromptu vibe. These types of chairs are often used for weddings and anniversaries but they can also look amazing in more contemporary settings as well. Create a fairy-tale ambience by using high back or cross back chairs or add an air of elegance and sophistication with ice or ghost chairs. Talking of ice and ghost chairs, clear or transparent chairs create a really interesting atmosphere and because they are not coloured they match with everything. They look particularly great for winter themes and are amazing when used indoors with different lights shining off them. Benches don’t have to be boring or overlooked, in fact they can be used in lots of different settings. Use wooden ones and arrange in rows for a traditional wedding or dot LED ones around outside a party to create extra seating and lighting at the same time. These are great for when the weather is hot and warm enough to hold your event outdoors. It is also a lovely relaxed way to hold a conference or party and if you are a business why not get branded blankets that workers can take home with them? Perfect for any indoor or outdoor event where you want a rustic or relaxed atmosphere. The beauty about hay bales is that you can bung them anywhere, in groups or on their own to create seating areas or even to cordon off spaces for different activities. Not just for children’s parties or fun events, inflatables come in all different shapes and styles and can used to reflect innovation or the unique nature of the event or company. You’d be surprised how many top companies such as Cisco and Google use things like bean bags to provide seating for their customers or workers. It instantly creates a friendly atmosphere and encourages networking and talking with others. Every event needs a seating area but it doesn’t have to be boring. We hope we have inspired you with some alternative seating ideas so that you can turn something typically ordinary into a quirky experience.